Canada’s economy stepped up a gear in April, pumping out a surprisingly strong 58,300 jobs—almost all of them in the province of Ontario and a big portion of them part-time. Year over year gain increassed to 283k. Economic growth is still surprisingly strong here in Canada and inflation comes with the territory. Inflation numbers will come out Friday , another hike expected. Food and energy are mostly responsible. We expect the trend to continue but a more moderate pace. Consumer confidence amongst US consumers rose in May. The U.S. Census Bureau announced a tenth consecutive monthly advance in retail sales for April. The 0.5% gain left the annual growth rate at a healthy 7.8%. Better than expected gains in the German and French economies powered eurozone growth ahead of economists’ forecasts. Concerns of weakening demand from China and other fast growing emerging markets in Asia are partly behind the devastating rout in commodity prices in past few weeks. Even as oil prices have pulled back from their recent highs, we expect them to return to or surpass the recent highs by next year over the mid-term. With very accommodative government policies in the U.S. and Europe, growing consumption from the emerging countries and compelling stock valuations, equities remain attractive investments. However, market turbulence will remain high as the world’s economies continue to work their way out of the recent economic slowdown. Remember to stay invested through a widely diversified portfolio in relation to your needs and you will as always, weather through this just fine. 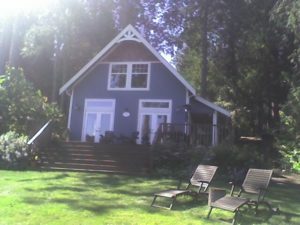 For those who have not seen our cottage yet, I thought I would attach a picture before the weeds start coming up again!